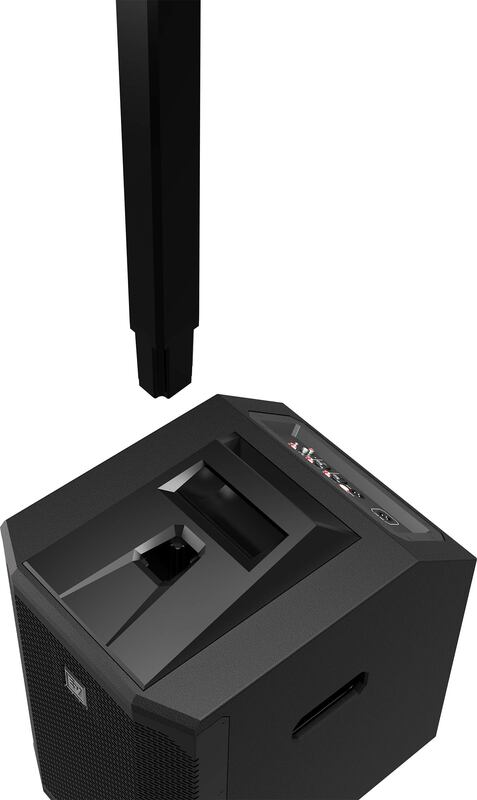 The EVOLVE 50 Portable Column System is a three component loudspeaker system powered by a 1000 W Class-D amplifier and driven by Electro-Voice's QuickSmartDSP. 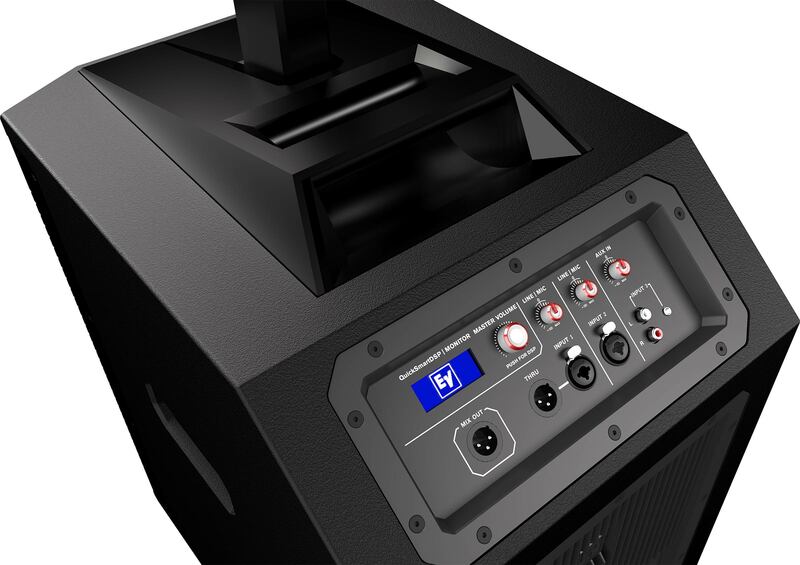 The system consists of a 15 mm wooden, ported, powered subwoofer enclosure that houses a 12” subwoofer capable of a functional frequency output down to 37 Hz. The bi-directional aluminum pole’s connection to the subwoofer is secured using a magnet, and the column array is gravity-held to the sub pole. The signal is internally routed to the components. Eight 3.5" neodymium drivers in the column array coupled with the 12" subwoofer delivers up to 127 dB SPL. The eight composite waveguides control high frequencies with 120° of horizontal coverage, and 40° of asymmetrical (down-facing) vertical coverage to ensure suitable output for sitting and standing audiences. The sub pole and column array come prepackaged in a carrying bag. The processing engine allows for easy setup via four presets (Music, Live, Speech, and Club), three-band EQ, five user-programmable presets (Store and Recall settings), output delay, phantom power (+15V), visual monitoring of limiter status, input level control and meters, and master volume control to ensure optimal gain structure. The new Electro-Voice QuickSmart Mobile application utilizes Bluetooth® Low Energy (BTLE) technology for the wireless configuration, control, and monitoring of up to six EVOLVE 50 systems simultaneously. High resolution Bluetooth® audio streaming adds convenience for wireless music playback in breakout rooms, intermission, and musical accompaniment. Bluetooth® is available in select countries. EV QUICKSMART MOBILE APPLICATION: QUICKLY AND WIRELESSLY CONFIGURE, CONTROL, AND MONITOR UP TO SIX EVOLVE 50 SYSTEMS SIMULTANEOUSLY, AND RECEIVE IMMEDIATE NOTIFICATION DURING CRITICAL PERFORMANCE CONDITIONS. ULTRA-WIDE 120° HORIZONTAL COVERAGE VIA CUSTOM DESIGNED WAVEGUIDES AND ARRAY-FORMED 40° ASYMMETRICAL VERTICAL COVERAGE MEANS ALL ACOUSTICAL ENERGY IS DIRECTED TOWARDS BOTH SITTING AND STANDING AUDIENCES. QUICKSMARTDSP PROVIDES BEST-IN-CLASS PROCESSING VIA EV'S SIGNATURE SINGLE-KNOB USER INTERFACE WITH LCD. IDEAL FOR PORTABLE APPLICATIONS. 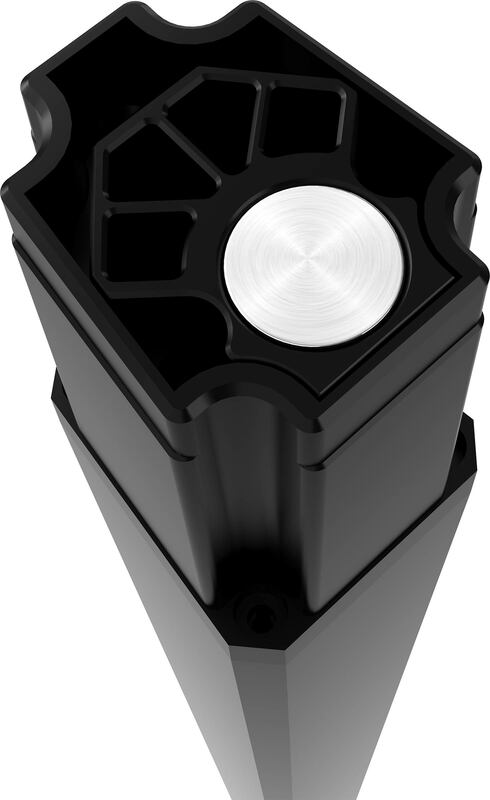 LIGHT WEIGHT AND INTUITIVE ASSEMBLY VIA THE MAGNET ASSISTED SUB POLE MAKE A QUALITY PERFORMANCE EASIER THAN EVER.